Each year several friends of ours from Zukiworld put on an event called the Fall Classic. 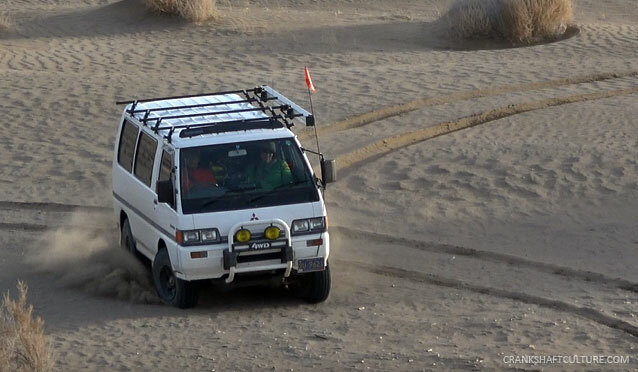 This overland / off-road / camping event has a host of vehicles (mainly Suzuki 4x4s, obviously) that head out to explore central Oregon’s high desert country. While we don’t have a Suzuki these days, we got the OK to bring our 1989 Mitsubishi Delica Star Wagon, aka, the Space Tractor. While on our adventure, our friend, Matt Verley, put together clips of the Space Tractor in action at the Christmas Valley sand dunes and along the trail. In total, the Fall Classic group put on about 200 miles off pavement on Saturday and many more on the surrounding days. And yes the Delica did great. Sure, there was some protest starting in sub-freezing temperatures (it is nearly 30 years old, after all), but otherwise we had no complaints or issues. We were actually very impressed at how capable it was in the sand. We figured it’d sink like a rock, but we aired our Yokohama Geolandar A/T G015 tires down to 15 PSI, and the Space Tractor became the Sand Tractor. We’ll have a full write-up on the Yokohamas in the coming days.